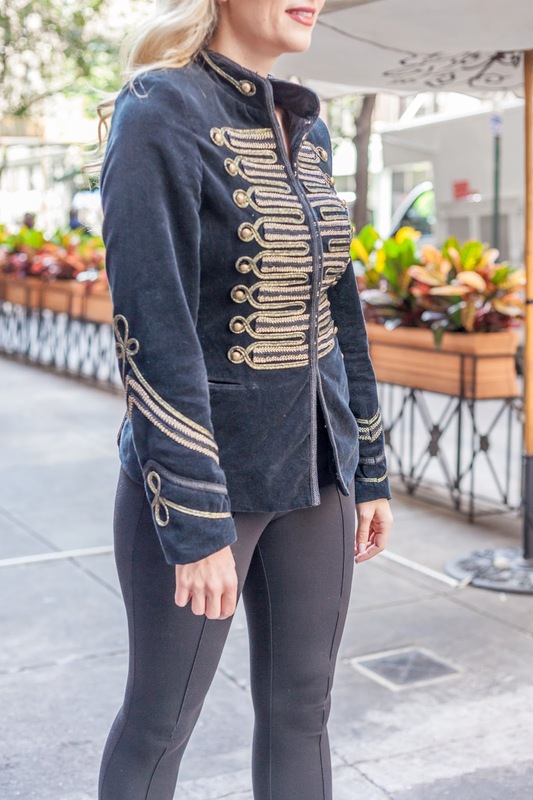 Velvet is everywhere this season – and I love this blazer because of the combination of the softer more feminine velvet trend with the military inspired trend. The contrast makes for an awesome blazer; and a great wear-to-work item for fall and winter! Sadly this Blank NYC blazer sold out before I could share this outfit with you guys; but I did link up two blazers below that are both velvet and military inspired. For the rest of my outfit I went with what are my most classic work wear pieces – skinny dress pants and black patent heels. You’ve seen these heels a ton on this blog; they are the most comfortable heels I own! (Read more about them in my guide to the best heels for work) These black pants are from Boden and I love the seam detail down the front. Such a great addition! I wore this outfit when I was in New York last month and definitely can’t wait to wear it more this fall. If you follow along on my instagram you likely know that while I am in trial I have to wear court robes and so haven’t had the opportunity to wear many of my fall wear-to-work outfits. I will definitely be re-creating this look once I have a day in the office. …Though I may swap out the heels for ankle boots because the weather in Vancouver has been insanely rainy lately! This weekend was such a great one – from a girls day baking apple pies, a halloween party, and pumpking carving, it was the perfect fun fall weekend. I create ‘to do’ lists at the start of each season with all the fun things I would love to do (… my type a organization knows no bounds; i know! :S) As of this weekend I have now checked off most of my list!! I think all that remains is to do a “weekend getaway” and to try this dessert restaurant here in Vancouver called Cacao 70. Do you have any “must-do” favorite fall activities?? "Overalls you Can Actually Wear As An Adult"
I'm obsessed with your blazer! It's so chic and elegant! And you styled it beautifully!